For a ridiculously short, short movie this has to be rather swift in its deliverance so it gets straight down to business. 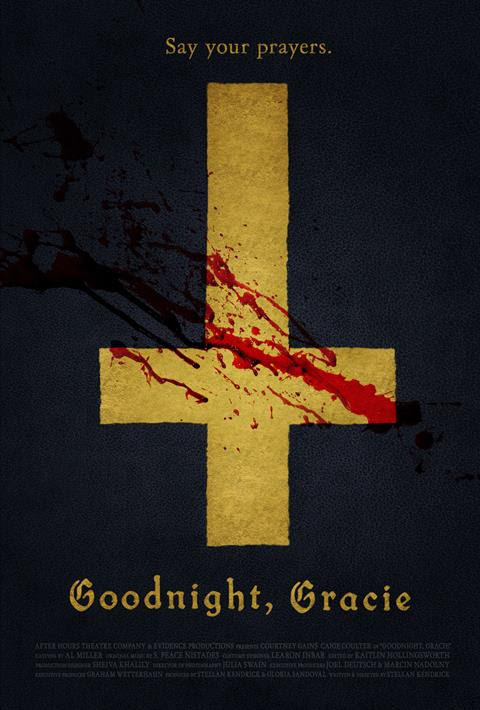 One quiet night a small girl who has fallen asleep on her bible is awoken by a loud bang and the sound of screaming, grabbing her torch she ventures out of her room to find an axe murderer dispatching her mother. On seeing her, the axe wielding maniac follows the girl to her room to find her frantically reciting passages from the good book to repel this evil man…..but will it work? As it is too short to go into much detail I am unsure if the murderer (who may or may not be her father) is possessed or not as at the very beginning there are things that would suggest that he is but the way it ends does not, so I guess it’s a make up your own mind as to what may have happened previously. It combines supernatural with a bit of gore which is pretty good. The young girl who plays Gracie (Caige Coulter) is very young and does an ok job as the main focus and Courtney Gains plays the evil axe murderer well. It has a dark and spooky atmosphere to it as well but because it’s so short you don’t get a chance to really appreciate everything it is trying to portray. I did enjoy the song over the end credits which reminded me of a Tubular Bells mixed with a bit of John Carpenter.